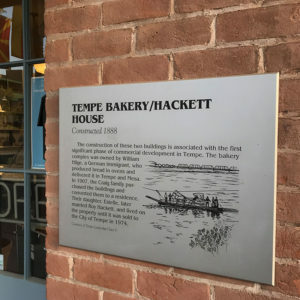 William Hilge, a German immigrant to Tempe, built Hackett House in 1888 as Tempe’s first bakery. Mr. Hilge constructed two buildings from fired red brick at the corner of Fourth and Maple, conveniently located near the Hayden flourmill, the railroad, and the Territorial Normal School (now ASU). The ovens were located in the back building while freshly baked bread and pastries were displayed on the front window shelves to tempt passersbys. After Mr. Hilge’s death in 1905, the buildings were sold to the Craig family from Texas, who converted the building into a residence and later into a boarding house. Hackett House received its name when Tempe’s first telephone operator, Estelle Craig, married Roy Hackett in the old bakery house. In 1974 the City of Tempe acquired the property from Mrs. Hackett, restored the building to its 1912 appearance, and put the property on the National Register of Historic Places. Today Hackett House is the oldest fired red brick building in Tempe and a rare example of Arizona Territorial Victorian commercial architecture. It serves as headquarters for the Tempe Sister Cities organization and is visited by hundreds of national and international guests each year. Would you like to be a part of the future of Hackett House? With our exciting community programs, we strive to make a difference in our Tempe community. To do this, we rely on dedicated volunteers. Please follow this link to learn more about the volunteer opportunities at Hackett House.